Claremont-Mudd-Scripps is an NCAA Division III athletic program comprised of student-athletes from three of the Claremont Colleges: Claremont McKenna, Harvey Mudd, and Scripps Colleges. CMS sponsors 10 men's (Stags) and 11 women's (Athenas) sports. CMS teams have won over 300 conference championships and seven team national championships since our inception in 1958. CMS was third nationally for the 2017-18 academic year in the prestigious NCAA Division III Directors’ Cup standings. The Directors’ Cup ranks college athletic programs based on their success at the NCAA Championships. The CMS Department of Athletics and Physical Education endeavors to enhance the liberal arts missions of Claremont McKenna, Harvey Mudd, and Scripps colleges. By providing excellent educational, recreational, and competitive opportunities, CMS strives to build community, promote lifelong health, foster personal leadership and team growth, and uphold standards of responsibility, perseverance, character, integrity, and inclusion. Through the Physical Education program students can take Pilates, train for a triathlon, practice archery, or go rock climbing. Students also engage in fierce yet friendly intramural games, play club sports, and take advantage of our fitness facilities. 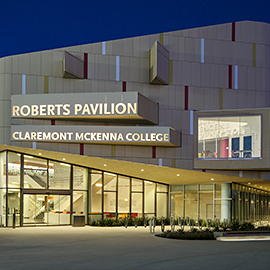 The Roberts Pavilion, which opened in the fall of 2016, is a spectacular on-campus fitness and events. Whether it’s to quench that competitive thirst or work out the kinks after a day of studying, CMC offers athletic opportunities for all. 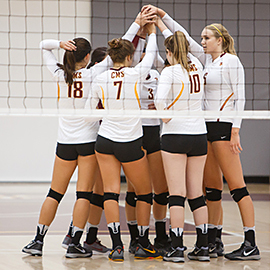 Find out more about CMS Athletics, one of the top athletic programs in the SCIAC and Division III. CMS has won seven team national championships in its history. The Athenas won national championships in 2017 in volleyball, and 2018 in golf and tennis. 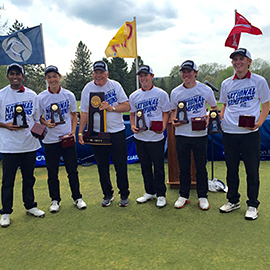 In 2016 the men’s golf team won its first national title. In 2015 the men’s tennis team won its second national championship after a tie for the title in 1981. Additionally, Claremont-Mudd won the NAIA swimming crown in 1967. Individually, CMS athletes have won 57 NCAA titles in eight sports including men’s golf, women's golf, men’s and women’s swimming, men’s and women’s tennis, and men’s and women’s track & field.